In response to a comment that irked me, I started to leave the following comment on a post I had enjoyed. Then I realized the pointlessness of picking on the author of that blog. I enjoyed the post, but this comment touches upon a pet peeve. We Americans have a pronounced tendency to denigrate our fellow Americans. We love to say Americans have this failing or that failing. That strikes me as perverse, but it is what we have been taught to do. Yep! Other Americans — especially the masses — are so second-rate. Why do we want to say such negative things about our own countrymen (Admittedly, I have done it. So I think I know)? When there are all sorts of Americans, who exactly are we talking about? When we denigrate our fellow Americans, what I think we are doing is denigrating a caricature, that thing of legend we call The Ugly American. And I think we do it in pride. We do it to prove our own outstanding tolerance by denigrating the intolerance of the stereotypical Ugly American. Yet is this not in fact a form of bias? Against our fellow Americans? Sadly, when we denigrate our fellow Americans, we also denigrate Americanism, the philosophy that bound together the people who founded this country. For the sake of our children we need to step back and think about that. Should we be denigrating our own heritage? When I look at the founding of our nation and the nature of our government, I see a people who once had a profound respect for the Bible and the God of the Bible. What I see tearing apart our country is not Americanism; it is Secularism. As Americans we have failed to pass on to our children the traditions of the people — the Christians — who risked all to found this nation. Because we have given the matter so little thought, we are perverting our culture by slowly replacing our Christian heritage with a Secularist ideology that is replete with lies. Lies against any belief in God and against Christianity in particular. Consider. When first century Christians spread the Gospel, they engaged in a stubborn political as well as religious battle. They actively spread the Gospel. At the same time they passively resisted the overwhelming power of the Roman Empire. Sometimes even at the cost of their lives they refused to worship the Emperor. Those early Christians gave God’s authority in their lives precedence over the authority of government. This, giving God precedence over government, is Americanism. 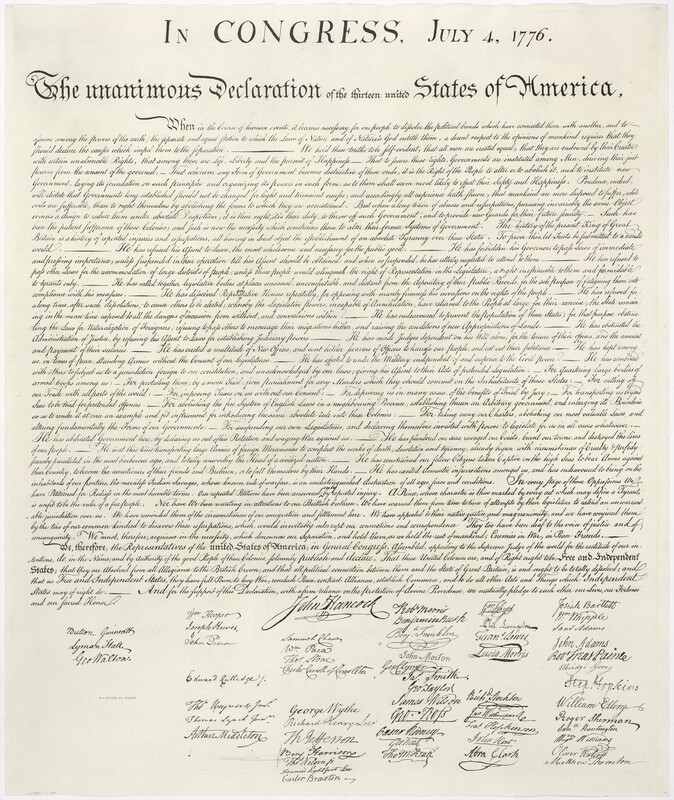 As the Declaration of Independence states, we have God-given, not government-given rights. To whom do you give precedence in your life? Are you an American in the tradition that founded this nation, or are you a Secularist who denigrates the character of his fellow Americans? Think about it. HOW DID YOUR CONGRESSMAN VOTE ON THE AMERICAN HEALTH CARE ACT? Unfortunately, it is easier for people to lower their standards and morals than to raise them. The question is how much lower will American standards and morals continue on a downward trend? Sad. Who knows the future? All we can do is pray and do our best. I agree, no one knows the future. However, we teach statistics and marketing techniques to determine risk factors. Based on my business experience and reading the newspaper this morning, I am very pessimistic on the risk factors we as a nation are encountering. For example, the future does not look promising for the poor, unskilled, or sick. Will praying for them help? Based on my business experience, I found that the squeeky wheel gets the most grease. However, the trend is less people pray nowadays. If less pray, will God not hear as well the prayers and laments? Faith tells me that there is a purpose for God allowing our nation and world to continue on a downward trends. Sure hope God does not believe in the squeeky wheel proverb. If so the future is not looking too good in our nation. I am not an expert on prayer. Doubt anyone except Jesus could rightly call themselves one. Nevertheless, I think the purpose of prayer is to determine what God would have us do. In prayer we thank God for what we have, and we try to see things from God’s point-of-view. We ask our Lord to help us understand and execute the tasks He has given us. Here I think we do well to remember Romans 8:28. It is unlikely God will ask us to do much that seems highly significant. In the quest for salvation, is it not true that only Jesus had a major role? Anyway, what we ask in Jesus’ name will be granted (John 16:23). So there is not much point in asking in Jesus’ name if it is not something Jesus wants to happen. Progressive leftism is a truly vexing political philosophy. At once appealing so effectively to our yearning for justice and reducing the value of human life to the contents of a hospital bed pan. What Socialists call social justice is just an unjust excuse to take what justly belongs to someone else. I doubt we agree in substance, but… I don’t doubt you love this country, but we both love it in spite of how most of us were educated in the public schools and indoctrinated by the mass media. Do you know how many times I have heard religion causes wars? Yet anyone who has read James 4:1-3 knows that is not true. Let’s consider that phrase, “little rebellion”. Look up the definition of the word “rebellion”. Only in the West is a little rebellion tolerated from adults. Elsewhere rebellion is a serious matter. Everywhere else you are likely to be shot. Thomas Jefferson talked about watering the tree of liberty with blood. His was a generation that understood rebellion. We have almost forgotten why that generation rebelled and just how serious that rebellion was. What made America unique? Here are some examples. Our people paid taxes without a fuss. We willingly obeyed the laws because they were our laws. Am I hearkening to back to a fairy tale? No. I only know of the 1830’s from what I have read. Still, don’t we belong to the last generation that still remembers leaving the doors to our house unlocked and not worrying about it? There is this thing called “honor”. It is being lost. The Secularists would replace it with something far less durable, “reason”. But honor is based upon faith in God, and reason is only based upon faith in man. If we want a government that honors God, then we must understand from whence it comes. Think about that phrase we use to describe the Bible, “the Word of God”. Words have power, and our opponents know it. When we speak of the American culture, we use a word symbol, “American”. That word brings to mind the flag, the Liberty Bell, the Founders, and the ideas that made America what it is. So when we use that word, we have to be very careful that we actually criticize what we intend to criticize. If what we intend to criticize is not something that is truly American, but something else, then we should use the correct word. For there are people who are quite willing to understand us to have said that it is Americanism that is evil, not some vile new feature of the culture of this post Christian nation. I meant to say “I doubt we disagree in substance”. It can be embarrassing to accidentally drop a little word like “not” or even a prefix like “dis”. Since I am less likely to put my foot in my mouth, I prefer blogging to public speaking, but it seems there is no way for the accident prone to avoid stumbling. Since I worked for a government agency in a secure environment (classified data), I have never been in hurry to adopt miniaturized communications technology. Still use an old flip phone and avoid texting like the plague. If I have to have web access away from home, I have a laptop. Played with my elder daughter’s IPAD, but I am so absent minded I would dread losing the darn thing if I bought one. I never wear out an umbrella. Today especially we need to pray for our country. God is the only answer. Great post. Amen, Tom. Good pet peeve. I’m kind of a fan of a bit of American exceptionalism. We’re like a family or a tribe, so deeply flawed of course, but we need to lift one another up, see the unity there, give ourselves some credit. Well, that is the stock lots of us come from. Over the years I have begun realize that what we stand against does not matter much. What we stand for, however, does. If we stand for what is right, then we will invariably stand against what is wrong.